Creek and watershed restoration not only improves the environment for wildlife such as birds and fish, but also gives people a chance to have meaningful contact with nature in the urban context, reminding us that we all benefit from the improvement and protection of our natural resources. 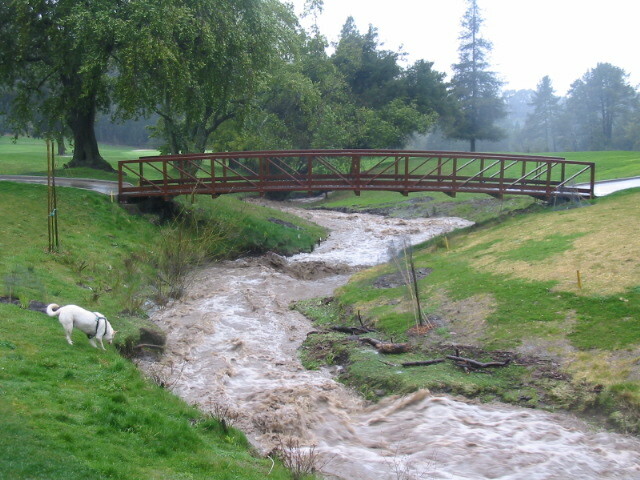 In fall 2006, UCC implemented the first phase of a major restoration project on Wildcat Creek in the City of San Pablo. This 500 foot project included realigning the channel to increase sinuosity, re-establishing a functioning floodplain, and excavating excess sediment from the active channel. With assistance from the East Bay Conservation Corps and volunteer students from Richmond High School, UCC will continue to revegetate the site with native riparian plants. This project is part of the Wildcat-San Pablo Creeks Watershed Restoration Action Plan and Priority Projects (WCSP-WRAPP), the main goal of which is to develop a community- and City-supported plan to reduce flood damages in the City of San Pablo while preserving the natural qualities of its creeks. Our team of East Bay water experts is completing its assessment of existing physical, hydrologic, and biological conditions along Wildcat Creek. We are now exploring site-specific action alternatives for possible future implementation by the US Army Corps of Engineers. These potential alternatives—including culvert removals, floodwater detention, and in-stream channel modifications—will be presented to San Pablo residents in a series of community meetings. The Watershed Council and the City of San Pablo will make the final approvals regarding the contents of the Watershed Restoration Action Plan due in February 2007. Alhambra Creek at Martinez Adult Education, Martinez. Urban Creeks Council worked with the Muir Heritage Land Trust, Martinez Unified School District, City of Martinez, Friends of Alhambra Creek, and the Alhambra Creek Watershed Planning Group to restore two sections of Alhambra creek at the Martinez Alternative Education Campus. The restoration, completed in fall 2004, reduced erosion by replacing failed gabions and bioengineering the banks, improved riparian habitat by the removal of invasive plants and replacement with native riparian plants, improved fish habitat for the population of steelhead/rainbow trout. A trail now provides public access to the creek, and riparian vegetation is establishing. The students at the school have created a creekside garden and a watershed based mural. They will continue to be involved with the monitoring of this project. This project was funded by the Department of Water Resources Urban Streams Restoration Program. View this project’s final report! Codornices Creek Watershed Restoration Action Plan (CCWRAP), Berkeley. 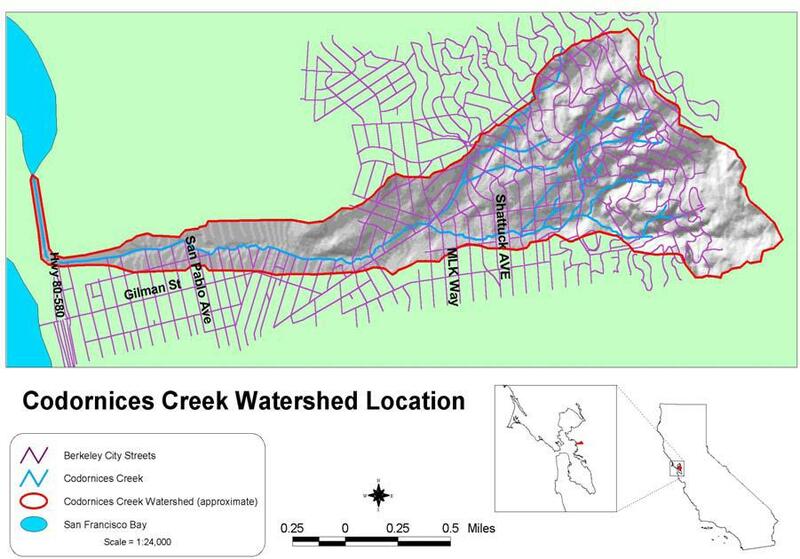 This project seeks to improve habitat and migration for threatened steelhead/rainbow trout (Oncorhynchus mykiss) in Codornices Creek through watershed planning, in-the-ground projects, and community involvement. The first phase of this project was conducted from 2001-2004 and developed a written Codornices Creek Watershed Restoration Action Plan (2004). Data collected on existing water quality and stream conditions was used to identify priority projects that would improve habitat and stream health. Conceptual designs developed for the identified priority projects were develped and modeled by FarWest Restoration Engineering to analyze potential hydraulic impacts. The results of this work are presented in a 2005 report. Currently UCC is working on CCWRAP-Phase II. This phase works to implement recommendations of the 2004 CCWRAP Plan in order to improve habitat and migration for threatened steelhead/rainbow trout in Codornices Creek. Project components include implementation of identified priority restoration projects; monitoring of existing fish population, habitat, and water quality through electrofishing surveys, spawning surveys and outmigrant trapping; pebble counts, residual pool depth surveys, macrobenthic invertebrate surveys, and weekly water quality testing; and working with creekside property owners to create “fish-friendly” yards. Step-pools and bank stabilization measures were designed for a 1000 foot stretch of Codornices Creek extending downstream from the Albina Avenue crossing. The design removes the current upstream fish passage barrier to allow salmonids of all life stages to migrate upstream for spawning, and improves spawning gravel throughout the reach by minimizing sedimentation from the largest erosion site identified in the watershed. Implementation of the priority project at Albina Avenue is scheduled for Summer 2007. Funded by CALFED Watershed Program and CA State Water Resources Control Board. Click here to get the latest updates and learn more about this exciting project! Updated! Monitoring report on fish population, fish habitat, and water quality data collected 2005-2006. 3.) development of monitoring plan for Codornices Creek and Urban Fishery Restoration Manual for use in measuring the impact of restoration projects within the watershed. This grant is funded by the San Francisco Bay Salmonid Habitat Restoration Fund and will be complete June 2007. Peralta Creek at Cesar Chavez Park, Oakland. In 2002, this section of creek was degraded and virtually forgotten. The intent of the design was to improve the natural function of the creek, attract wildlife, reintroduce native flora to the site, and create a more community-oriented space for the schoolchildren and residents that pass through the park every day. 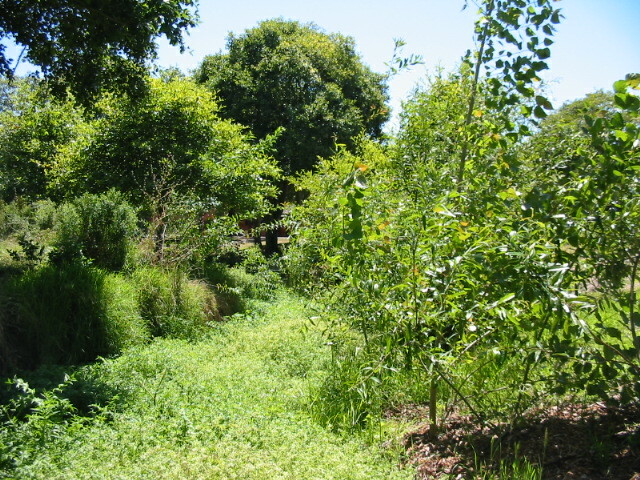 The installation of the design in summer 2003 removed a faulty and dangerous bypass culvert, re-graded the banks, replaced an old bridge for a safer, crime-deterrent design, and removed extensive non-native vegetation such as Acacia and Eucalyptus trees. There is now a decomposed-granite path running next to the creek, willow trees growing along the toe of the banks, and native grasses and wildflowers blooming throughout. The native species that have been spotted since the project was installed include Pacific Chorus Frogs, white egrets, mallards, and raptors. Volunteer stewardship continues at the site with supplemental native planting days and trash cleanup. This site is also featured in the City of Oakland’s Creek to Bay Day each September. This project was funded by the Department of Water Resources. Wildcat Creek at Church Lane, San Pablo. In partnership with the City of San Pablo, UCC removed failed walls and non-native species from unstable and eroding banks. A cross-vane weir was constructed in the channel to redirect energy to the center of the channel instead of the banks, to reduce erosion and to provide pool habitat for fish and other fauna. The banks were stabilized with willow and cottonwood cuttings, native grasses and wildflowers, and brush layering and brush mattress soil bioengineering techniques. This project will not only reduce erosion, but also create important habitat for birds and the population of rainbow trout/steelhead in Wildcat Creek. This project will also beautify downtown San Pablo, with benefits for local businesses and residents. The Senior Center on the left bank enjoys a new pathway planted with native plants and with new viewpoints to the creek with benches, and a mural is painted on the culvert wall upstream. Pinole Creek Watershed Vision Plan and Lower Creek Restoration Plan, Pinole. With funding from the Coastal Conservancy, the Urban Creeks Council, Pinole Redevelopment Agency, Contra Costa Flood Control District, and Friends of Pinole Creek Watershed partnered to develop two plans. One is a broad-based vision for the entire watershed; the other is a restoration concept for the Pinole Creek flood control channel (from Interstate 80 to San Pablo Bay). The Vision Plan was developed through a consensus-based community process and included the participation of a diverse set of stakeholders throughout the watershed. The flood control channel restoration design will be submitted to the Army Corps of Engineers for potential implementation under the Section 1135 program, which allows the Corps to revisit and restore prior projects that have had detrimental resource impacts. Wildcat Creek at Tilden Park, supervised by Bhodi the dog. This photo shows the Tilden project performing in the winter storms of 2004. Wildcat Creek at Tilden Golf Course, Berkeley. In fall-winter 2002, UCC collaborated on the restoration of a 700 foot stretch of Wildcat Creek at the Tilden Golf Course. UCC performed the duties of project coordinator, project management, and supervision for implementing the dam removal and channel redesign. The project’s restoration design was provided by the Waterways Restoration Institute, a sister nonprofit to UCC. Six failing concrete check dams were removed along the reach, and the banks were restabilized to a 2:1 slope. Labor was provided by the East Bay Conservation Corps, and partners included Tilden Golf Course and Park staff, the East Bay Regional Parks District, and the American Golf Corporation. Funding provided by the Department of Water Resources. Lower Wildcat Creek, North Richmond. In 2000, this alternative flood-control channel was reconfigured by deepening the existing low-flow channel and restoring proper functioning to 5000 feet of stream. The banks were replanted with native willows and cottonwoods. Labor was provided by the East Bay Conservation Corps, under the supervision of UCC. Village Creek, Albany. In 1998, approximately 900 lineal feet of creek was daylighted (removed from an underground pipe and brought above ground) and planted with native willow, cottonwood, dogwood, and ninebark cuttings as well as alders, big leaf maple, and other native trees and shrubs from container stock. Labor was provided by the East Bay Conservation Corps, under the supervision of UCC.